Hello and welcome to my blog! A happy new year to all of you and hope you are all quite well. To start this new year I would like to present a my dining chair design. I am calling this Henry’s Chair after my son. I owe my inspiration to pursue a career as a furniture maker to my son, Henry. This chair is the product of many late night hours, the hours after cabinetmaking (the kitchen series wraps up pretty soon for those curious). Those evening hours and perhaps a few hundred cups of espresso. This project began much unlike my cabinet work. I start most projects by working out the details on a 3d CAD program. On this project, however, I found myself designing from abstract sketches and drawing directly onto the material. It seemed a better approach for organic shapes, such as this chair. With a rough sketch in hand, I set forth a few simple goals which would allow me to form a framework for my thought process. 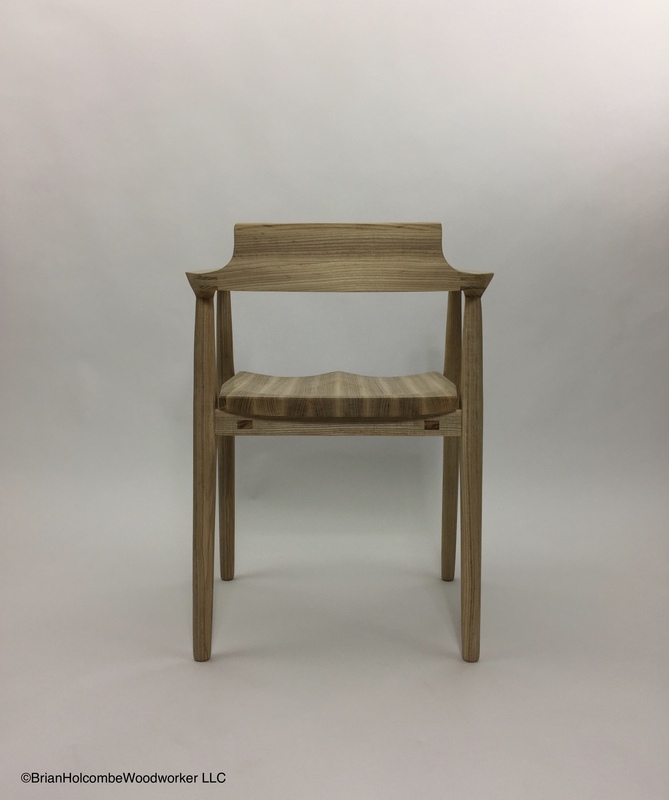 I wanted a chair made entirely of wood that was comfortable to sit in for an extended period of time and I wanted to utilize traditional joinery. With these parameters I began the prototyping work in white oak. Once the legs were blanked out, I assembled a seat from quartered oak then drew an approximation of what I wanted. Next I chopped the seat pan with an adze, known as a chona, and further refined the seat with a shi-ho-sori-ganna, or spoon bottom plane. After which I sawed the seat to an approximate shape but left it square enough to remain able to be worked on. I wanted the chair seat to be both visually and physically light. I turned the chair seat over and began planing away material to form a curve on the bottom side of the seat. The finished curve helped to create a light, coopered look to the seat. The seat at this point is also becoming physically light. Heft for dining chairs is something to be avoided, light and strong are more important than mass. Putting the seat aside, I turned my attention to the legs and cut mortises which would receive a stretcher’s tenons. I then created the corresponding stretchers and cut their tenons. With legs and seat ready I could begin to form my thoughts on what I wanted for the seat’s angle and position of the back legs. A dining chair should also have a slightly reclined angle to the seat, this helps put the user’s back against the backrest in a normal sitting position. After determining the location and angle I cut out a dado to house the stretcher. I wanted to support the stretchers in a way that would help them to resist racking in use. I connected the stretchers to their supports with sliding dovetails, a joint I would later reconsider. The dovetails simply did not provide enough resistance to racking. Now that the seat was in position I could turn my attention once again to the legs and create their approximate shape. Working from the shape of the Tea House chair arm to create a profile, I used this to connect the legs front to back, then joined the arms together with a backrest. For this chair I knew I would need to trim down the arm profile to match the proportion of the base, I did this in progressive steps working from something quite oversized until I began to hone in on what I wanted. I sculpted the backrest, alongside the arms, with shaves and gouges until arriving at a shape that I found appealing. I found myself endlessly drawing new lines onto the back and recutting it and the arms again and again. Once I found myself second guessing my edits I had a feeling I was getting close. After shaping the back and arms I considered the prototype complete. Deciding it was now time to photograph the design and ponder which changes needed to take place. It is often a change of format which can provide additional insight. Rather than continue to refine the original, I would put it aside and begin again. Restarting would provide an opportunity to both refine the details left open on the original, further hone in on the shape, change structural details, and gain insight into efficient process. Starting over, I cut mortised in turned legs, rather than shaved, as the finished product utilizes turned legs. Once they were roughly shaped as I wanted, I set them aside and glued up quarter sawn white ash which would become the chair seat. This chair seat would again arrive at its rough form by way of chona. This seat, I felt, needed a higher level of refinement than the previous. The coarse pattern left by the shi-ho-sori ganna provides a tactile experience that is enjoyable, however I could not reconcile with the tearout which resulted. I began the process of improvement by building a sotomaru ganna, or rounding plane, to make an evenly curved area for the legs. I used a small plane for the ramp and returned to the shi-ho-sori ganna for the seat bowl, which was finished with a scraper. Shi-ho-sori ganna, newly freshened with dovetail key mouth insert. The mouth had been wearing very rapidly due to how much pressure is applied to it. Next I revisited the structure beneath the seat, determining that I would replace the dovetails with through tenons. Then the back would be cut and shaped. The backrest joins to the arms with a bridle joint, now improved with a deliberate miter at the top of the joint to make the arm to backrest transition. The next step was to join the legs into the backrest assembly. The leg tenons join into the backrest assembly with perfect accuracy allowing very little room for error. After measuring a dozen times or so, I was ready to make the cuts. Luckily my marks were accurate, along with assumptions, and the chair assembled properly without fitment issues. The chair was now once again in rough form and ready for considerable shaping. With this effort now realized, I feel I’ve put forth a design which is light, strong and comfortable. I am very grateful to John Aniano, Prashun Patel and Liam Murphy for the help they kindly provided. For the moment I have taken some photos using the photo booth area of my workshop. I have some interesting plans, thanks to wonderful and generous friends, in regard to photography and settings of this chair coming up soon. I greatly appreciate the interest expressed toward my design and I’m producing these chairs completely in-house. Those interested in purchasing, please contact me directly. I currently building these chairs in ash and walnut. If you have another material in mind please mention it in your message. If you’d like to try out my chair, please schedule a visit to my studio. Can you tell me the name of the saw you used to cut the edges of the seat dado in the original prototype of Henry’s chair? I think your work is outstanding. It inspires me. Hi Jay, Thank you kindly! That saw is a Japanese panel saw known as Azebiki nokogiri. Hey, all I did was sit in the prototype and give you my comments! An interesting design, nice lines, very flowing in appearance. And please remember, be careful with all those new machines! Hi John, They were worth their weight in gold! Thank you again. Certainly will be careful, that’s of key importance to me. I like the declining line of the arms and how the design sits lightly but not disconnected from the ground. Hi Gabe, Thank you! I appreciate your comment. Awesome chair man, furniture making is no easy task but you nailed it with this one. (no pun intended).